SMALL and medium-sized enterprises (SMEs) in Singapore continue to feel the squeeze, bogged down by uncertainties in the global economy, a tough operating environment at home and hiring pressures. 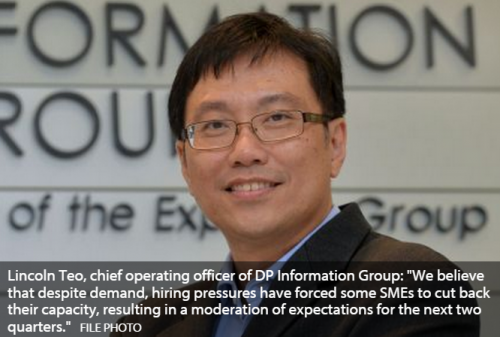 An index of business sentiment set up by the Singapore Business Federation (SBF) and the DP Information Group has indicated that business confidence among SMEs is at its lowest ebb since early 2013. The SBF-DP SME Index, which measures SMEs' business sentiment for the next six months, has recorded a third consecutive quarter of falling sentiment, with the outlook for the second half of the year having fallen from 54.0 to 53.5. "We believe that despite demand, hiring pressures have forced some SMEs to cut back their capacity, resulting in a moderation of expectations for the next two quarters. While optimism is declining, this is most likely due to an absence of good news than any particular piece of bad news." The index, compiled from interviews with 3,600 SMEs from across six industries, also measures companies' outlook for turnover and profitability; turnover outlook has fallen from 5.57 to 5.55, and profitability outlook, from 5.47 to 5.44. Companies also posted less optimistic outlooks for business expansion (a dip from 6.08 to 5.94) and hiring (5.70 to 5.46). On the upside, the outlook for access to financing held steady at 5.30, and the outlook for capital investment rose from 5.32 to 5.33. Of the six industries covered by the index, four came across less optimistic than three months ago - commerce/trading, manufacturing, retail/food and beverages (F&B) and transport/storage. Commerce/trading posted the biggest drop in optimism, from 53.9 to 53.0; retail/F&B, which the index recently started tracking, took a dip in optimism, from 51.5 to 51.0. The remaining two sectors were business services and construction. The outlook among business-services companies held steady, with an index score of 54.4, which happened to be the highest overall score among the six industries. This is the only sector in which the outlook for turnover and profitability rose (from 5.63 to 5.75 for turnover, and from 5.49 to 5.64 for profitability). The construction sector bucked the trend with a slight rise in its overall business confidence score, from 53.6 to 54. While companies in this sector expect their turnover to go up because of a rise in public construction activity - turnover outlook score rose from 5.56 to 5.59 - their profitability expectations fell from 5.47 to 5.33 on the back of higher operating costs from changes to foreign labour policies and more competition. The business services and construction sectors stand to gain from the opportunities presented in the Budget, from initiatives such as SkillsFuture, Smart Nation and the Capability Development Grant. The SBF and DP Info noted that SMEs have accepted productivity and operational-efficiency measures as the two most viable solutions for meeting year-end demand; businesses have also taken steps to invest capital to stave off manpower issues in the mid- to long term. SBF chief executive Ho Meng Kit encouraged small businesses to tap government programmes to raise their companies' capabilities, and to consider expanding abroad. On a more macro level, he noted that the survey findings - coupled with the lower forecast for Singapore's gross domestic product growth this year and the contraction in overall employment in Q1 after five years of sustained growth - could be signs that the economic restructuring policies were kicking in. "This situation merits closer monitoring to avoid our slipping into economic difficulties," he said.